IKEA’s signature clean lines and simple designs make it easy to transform their furniture into something uniquely yours. In fact, there’s an entire website dedicated to people who like to reinvent IKEA called IKEA Hackers. 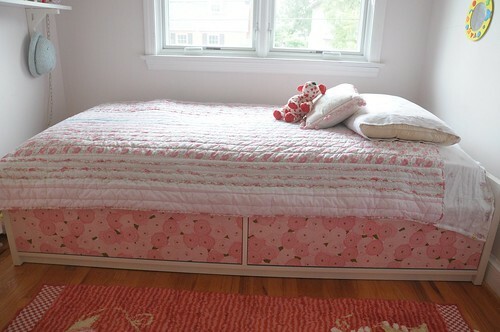 That’s exactly what I my friend Mary did when she needed a new bed for her 4-year-old daughter. Mary’s requirements were simple: The bed must be low to the ground and must have drawers underneath. 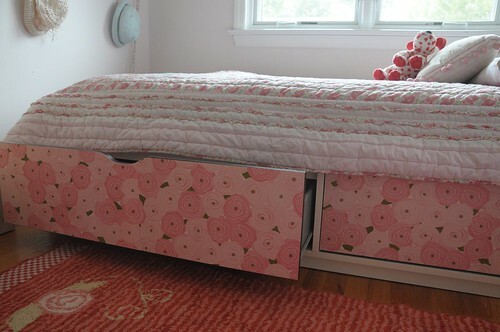 When Mary saw the ODDA bed, it met both criteria, but there was one major flaw: The black drawers would not work in the bedroom of her pink-loving girl. Not afraid of a DIY project, Mary decided there was an easy fix: She would recover the drawers in decorative paper (from Paper Source in Old Town) using Mod Podge. Step 1: Cut out the paper to fit exactly the same size as the drawers. 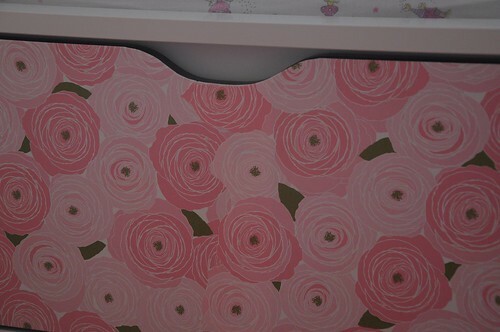 Step 2: Apply Mod Podge adhesive (available at Michael’s) to entire outside face of drawer. Step 3: Very carefully attach paper to the drawers — if paper doesn’t match up, it may be difficult to remove without ripping. Be very careful! Step 4: Allow the paper and glue to dry completely (at least one hour) and roll out any air bubbles before it dries. But don’t worry if you see wrinkles, these will most likely even out as the paper dries. Step 5: Apply one or two thick coats of Mod Podge (wait for first coat to dry before applying the second) over the paper to seal. This will give the paper shine and protect against dirt. Mod Podge will dry clear. The room is small so having multi-functional furniture is a must. These drawers offer much-needed storage space. Mary needed two pieces of paper for each drawer and she meticulously cut out the paper so the seams would not show. The floral paper fits right in with the overall look of the room. 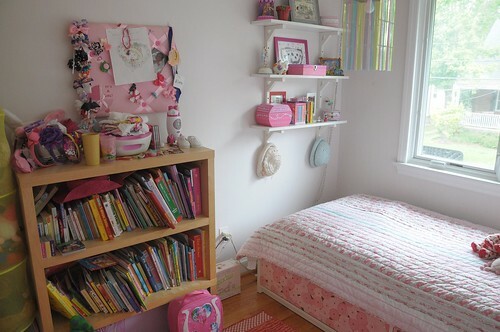 What 4-year-old girl wouldn’t feel special in this cute room! With creativity and patience, Mary turned an almost perfect piece of furniture into a one-of-a-kind bed for her Del Ray baby — sweet dreams! And now, we want to hear from you — what IKEA hacks have you completed? Interestingly enough, I’ve never done an IKEA hack! The closest is Mod Podging a bunch of different containers I bought there. I’m gonna have to get on it – this is super cute! It takes someone like you to show us we don’t have to live with products ‘as-is’; we can make something utilitarian look custom made! Thanks Jill — glad you liked the post! Thank you, i needed an idea of how to change the black drawers for my daughter’s room. I know i didn’t want to do the sanding and repainting them but I definitely didn’t care for the black drawers. She used decorative paper. You could use wrapping paper but probably best to use a good quality paper. A thin paper might tear easily.